Other Distinguishing Features: Warren Terror has a mullet hairstyle and a patriotic costume that resembles an American flag. Powers: Warren Terror can fire powerful explosive blasts from his hands. These can be used as projectiles but can also propel him through the sky giving him limited flight capabilities. Warren Terror was a deluded super-freak that believed that all Muslims were actually secretly terrorists. He vowed that as “while Warren Terror lives—terrorists die!” and proceeded to attack a group of innocent Muslims. Malcolm and Angel Dragon managed to fend this mentally-unstable man off before he could end any lives but they could not capture Warren who fled the scene using his powers. Following Malcolm’s graduation from middle school, the young hero went for a walk with his girlfriend Tierra Jones, unaware that Warren Terror had been trailing them. Warren claimed that Malcolm was a traitor to the United States by defending the Muslims that he had targeted. 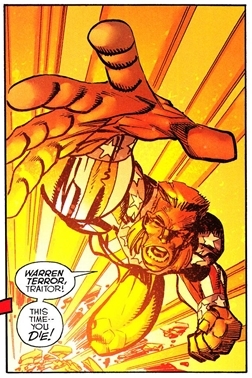 Warren vowed to kill Malcolm for his perceived crimes and began his assault on the hero. In an act of self-defense, Malcolm unleashed a powerful electric shock that accidentally killed Warren, leaving him a charred corpse that horrified Tierra.